Mentioned is the way you can write. People looking for jobs can easily download these Bachelor’s of Sciences in Software Engineer Resume Template in word or pdf format or just view it online to copy and paste. 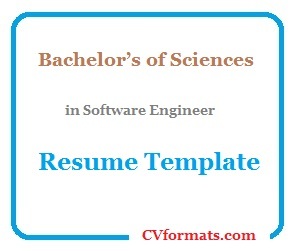 Cover letter of Bachelor’s of Sciences in Software Engineer Resume Template is also available. Just change the name , address , qualification and experience and your Bachelor’s of Sciences in Software Engineer Resume Template is ready. OBJECTIVE: To Work and grow in a Challenging Environment to Achieve the Assigned Objectives, Utilizing my Knowledge, Initiative, and Drive.  English Spoken Courses from M A Jinnah College Of Commerce Jhelum.  Course in Microsoft Office from M A Jinnah College Of Commerce Jhelum. This project is related to management of jobs and job seekers who are searching different jobs and manage their profiles their account details as well as their CVs. A job provider who is interested to post a job. When a job seeker applies to a job an email notification is sent to his account. And also it handles all related features. CVs Multilingual etc. The language is ASP.Net and tool is MS Visual Studio 2018 and also used AJAX. F G Sir Syed College Rawalpindi. F G Public School Jhelum.